The anticipation of something great seems to last forever. The "something great" is usually over in a flash! That is true of my recent trip to New York City. For a number of years, going to NYC at Christmas was on my bucket list. The thought of marveling at the intricate window displays, wandering Central Park with a light dusting of snow and just enjoying the magic that happens at Christmas in a city that has plenty of its own magic... well, the thought of those things was just so captivating! I wanted to experience it. Last week...it happened! There was no light dusting of snow - but I think, in the end, that was for the best. It was just as magical as I had hoped. We quickly learned to use the subway system, the difference between downtown and uptown and how friendly New Yorkers are! Everywhere we went, people were offering to help us find our way. 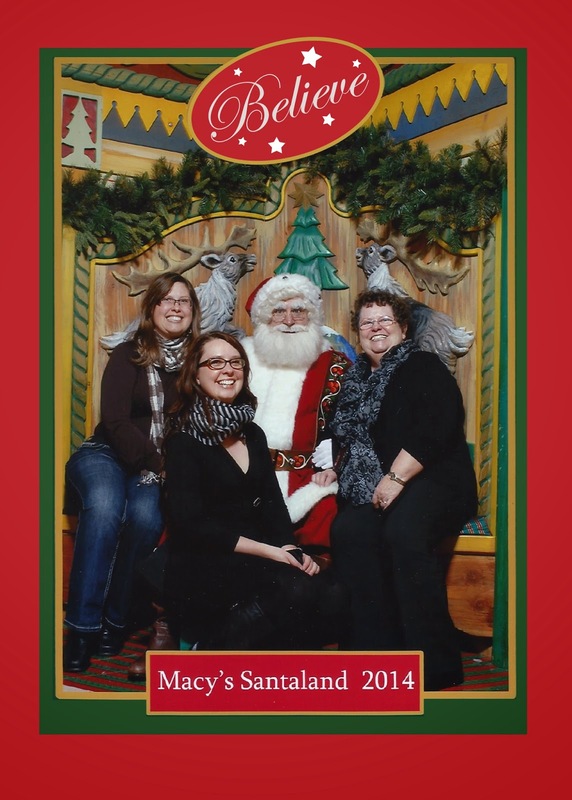 Seeing the window displays and Santa Claus at Macy's was a highlight for me. Miracle on 34th Street is, after all, my favourite Christmas movie! I also really enjoyed the Radio City Music Hall's Christmas Spectacular with the Rockettes. It just seemed like the quintessential New York at Christmas thing to do. I loved it! Another favourite moment was one of the guides on our hop on/hop off bus. He was quite a character! He saw my reaction when he pointed out things of interest to me: the hotel the Beatles stayed at during their first trip to NYC, the building Tony Bennett lives in, etc. When he found out I love Paul Simon, he stopped the tour and got out his iPod. He wanted to play a song and see if I knew it. Clearly, he didn't think I was much of a fan because immediately I recognized the notes of the 59th Street Bridge Song (Feelin' Groovy). I excitedly told him we were staying near that bridge and I had my photo taken with it. I think he thought he was going to share some new information with me, but I had it covered. Ha ha. When it was time for us to get off the bus, he was disappointed. He wanted me to stay on his tour. There were so many other moments to remember, but I can't share them all here! Already looking forward to my next trip back to this great city! Hobby blogger - here since 2005.